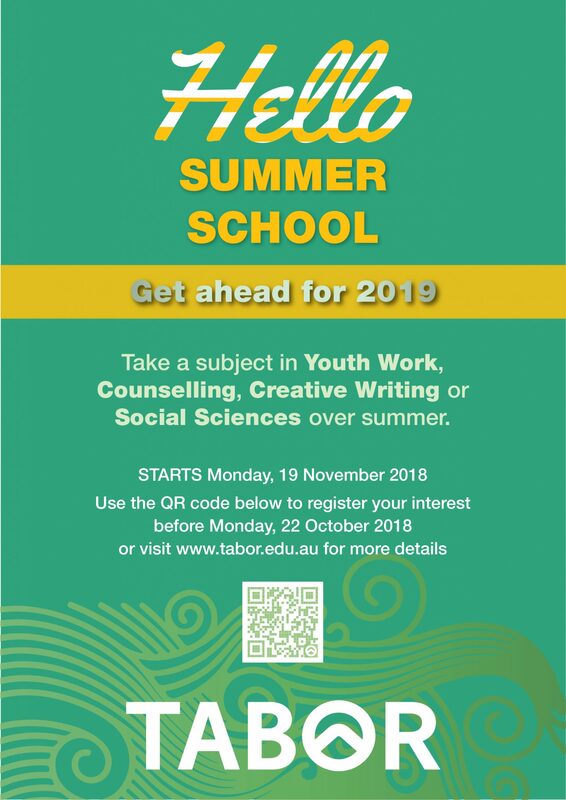 Tabor Summer School | Get ahead for 2019! Take a subject in Youth Work, Counselling, Creative Writing or Social Sciences over summer. This year we have opened some subjects for summer school and are taking expressions of interest. For more details on each course, click on the link to register and fill out the form if you are interested in any of the courses. Summer school is a great way to accelerate your learning, lighten your semester load and stay engaged over the summer break. It is self-directed study with lectures offered online (except for the Poetry Intensive) with tutor support through forums or workshops. We need a minimum of 3 students to open a subject and therefore need your expression of interest form done by Monday 22nd October.